My son Luke will be turning two in August, just a few months from now. 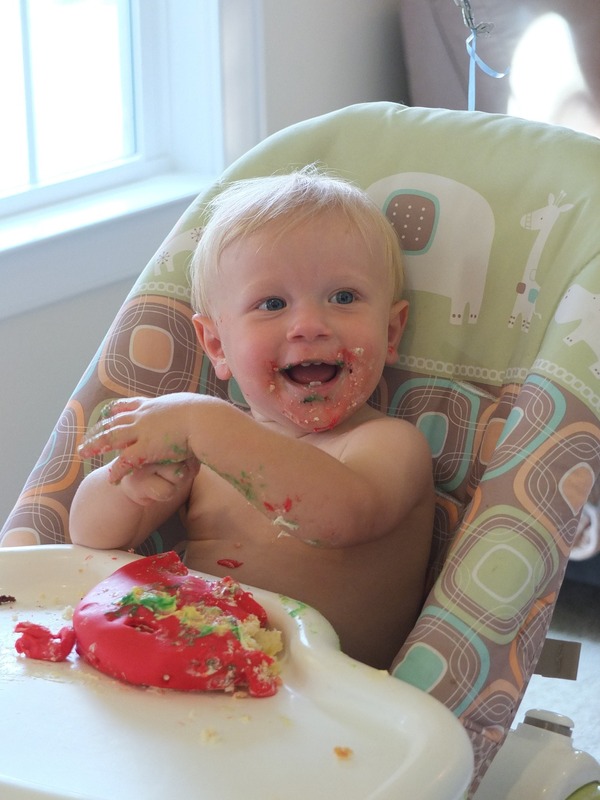 Which means that between savoring his last moments of baby-ness and packing away yet another set of outgrown clothes, I’m starting to think about a birthday party. All this despite the fact that I’m still heaving a sigh of relief from last year’s shindig. First, let me say this: I am decidedly an underachieving mom when it comes to parties and crafts and all-things-creative. Ninety-nine percent of the stuff I pin on Pinterest will never be attempted, unless I intend to be featured on one of those compilations of Pinterest fails. 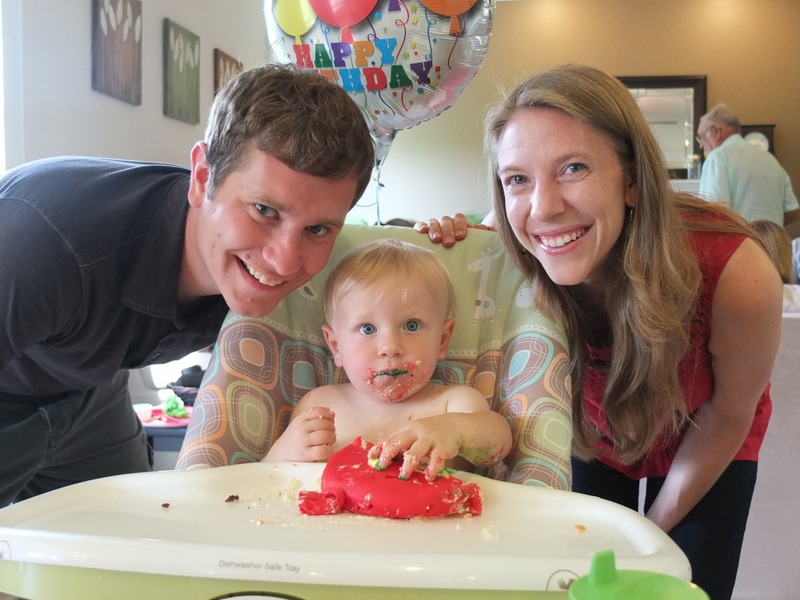 But for Luke’s first birthday party last summer, I felt like I needed to go all out—as if I wouldn’t be properly honoring the occasion if I didn’t at least try to find a creative bone in my body. So, since the amazingness of Luke’s first birthday party will probably never be recreated, I figured I could honor the memory by showing off what I accomplished in my best ever attempt to be Supermom. 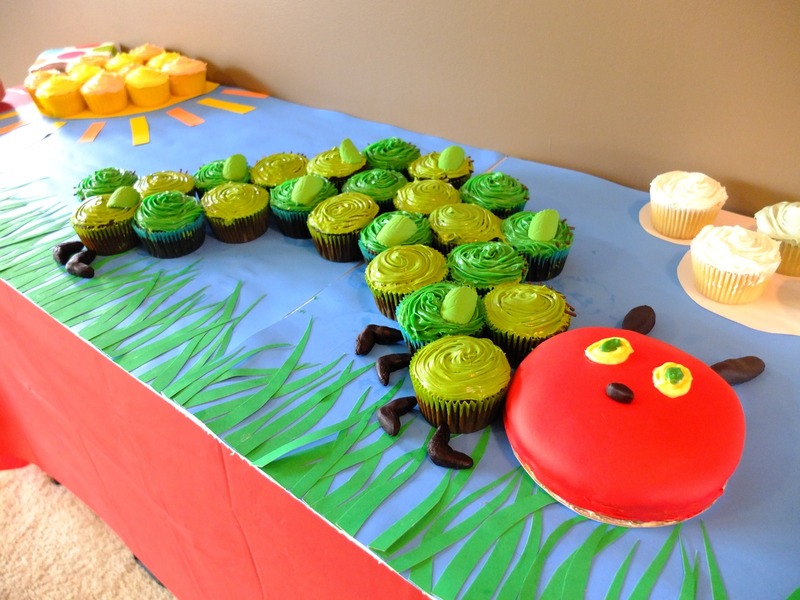 Complete with Eric Carle-themed invitations, decorations, and cupcakes. The only thing missing is a Hungry Caterpillar outfit—oh, how I wish the Eric Carle Collection from Gymboree had come out before his party! The garlands featured in the photo above are The World of Eric Carle(TM) Eric Carle Garlands from Amazon. They worked great! We probably could have managed to design the invites on our own, but in the interest of time we turned to Etsy and had these super cute ones designed and then we printed them ourselves. We followed these very simple instructions to create a Hungry Caterpillar Mobile out of paper lanterns. Another Etsy find! 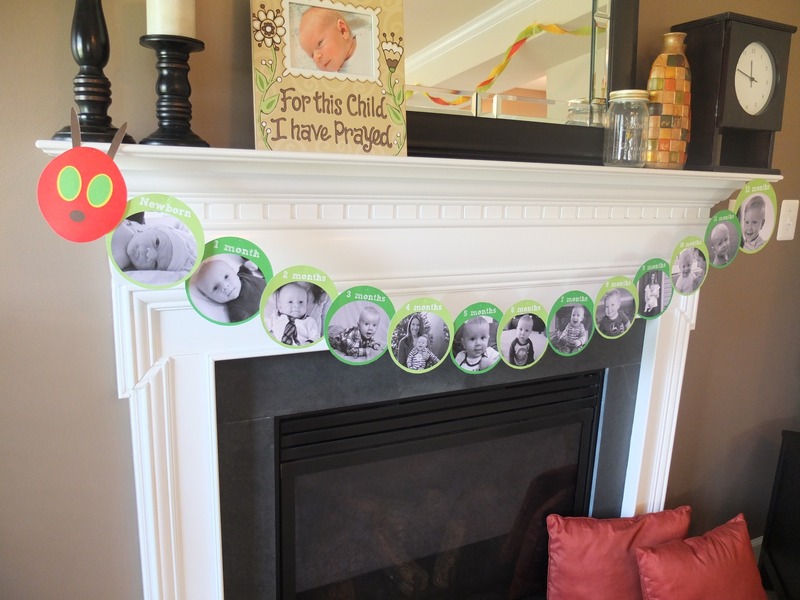 We hung the caterpillar from our mantel, and everyone loved seeing the progression of monthly photos from newborn to twelve months. The great thing about this theme was that I could use the foods eaten by the caterpillar in the book as my menu inspiration. 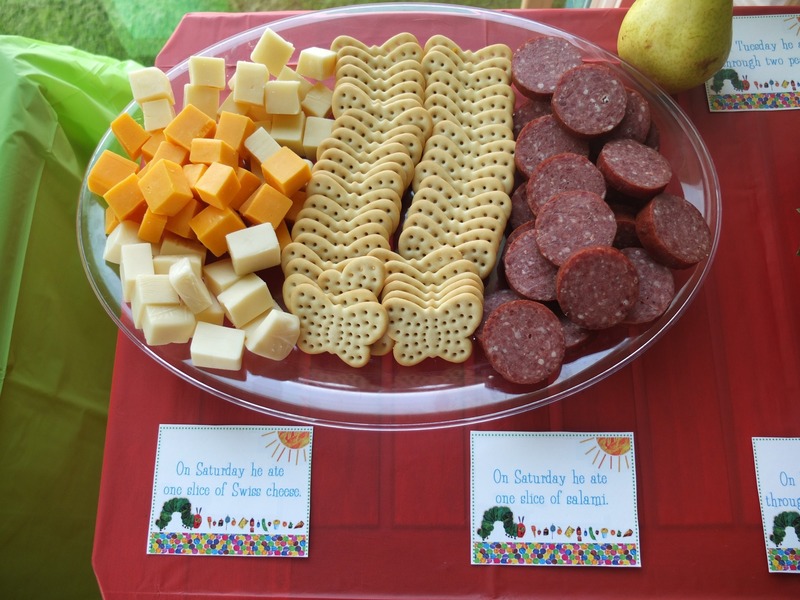 To help our guests make the connection, I downloaded these free Very Hungry Caterpillar food labels from Polkadots and Puppies. Thank you, Rachel! I saved the best for last—the cupcakes! I take zero credit for these; my lovely and artistic sister-in-law volunteered to make them, and she hit the ball out of the park! The whole scene included a sweetened-up sun and clouds, blades of grass, and a caterpillar-smash-cake-head. And smash it, he did! The bottom line? This party was a blast! 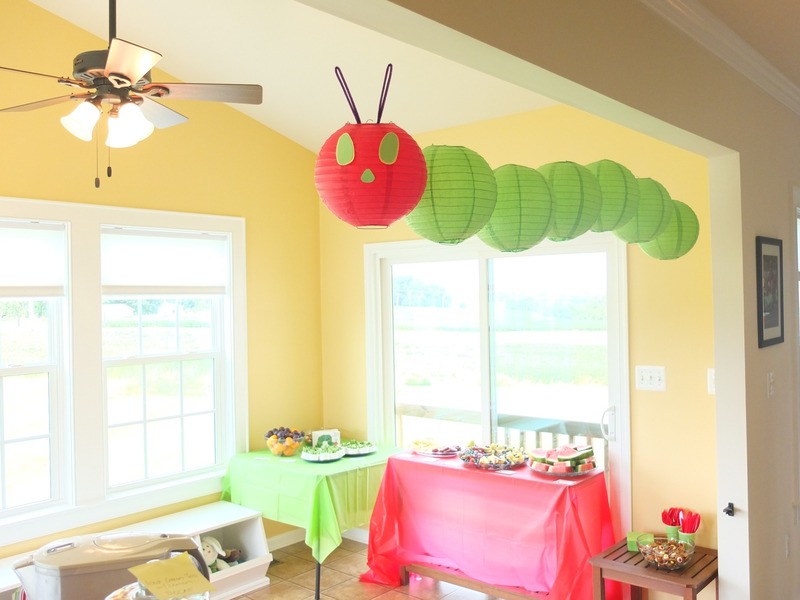 The Very Hungry Caterpillar makes for a great first birthday party theme. But like I said above, this is about as clever and Pinterest-y as I will ever be. 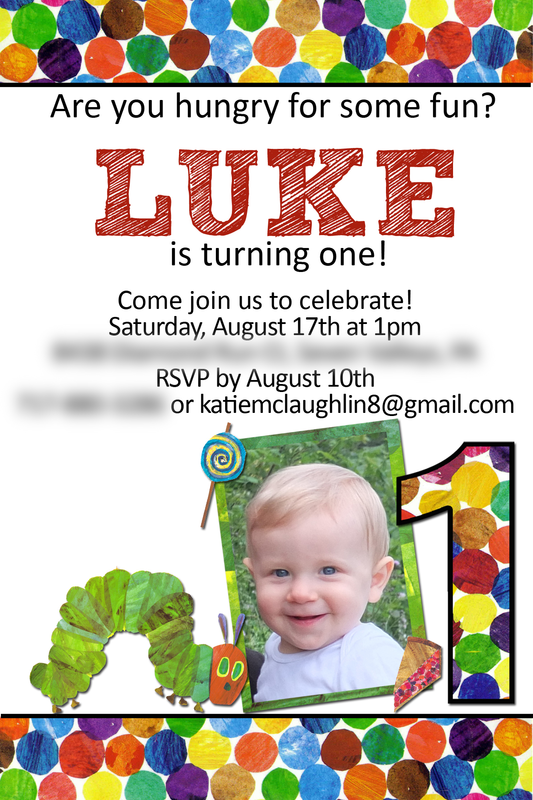 Family and friends, I make no promises when it comes to Luke’s 2nd birthday celebration in August! 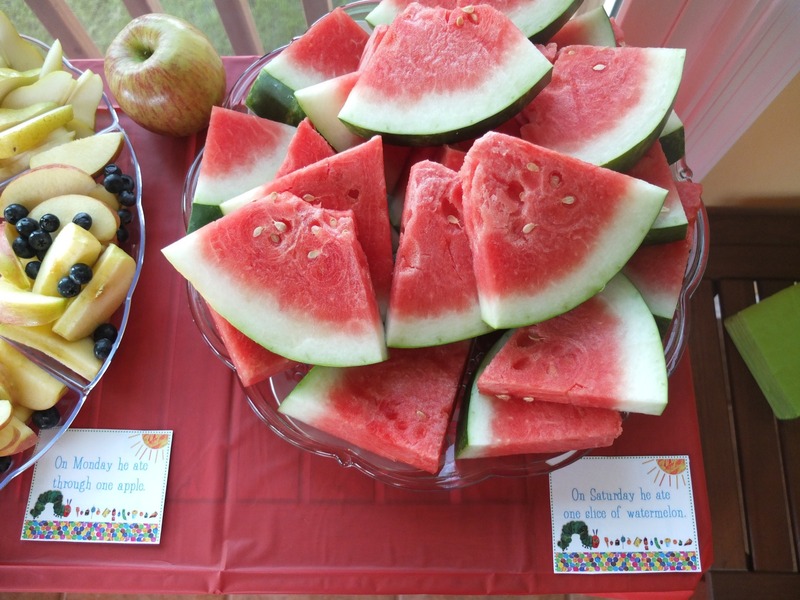 Do you use themes for your children’s birthday parties? If so, which was your favorite? 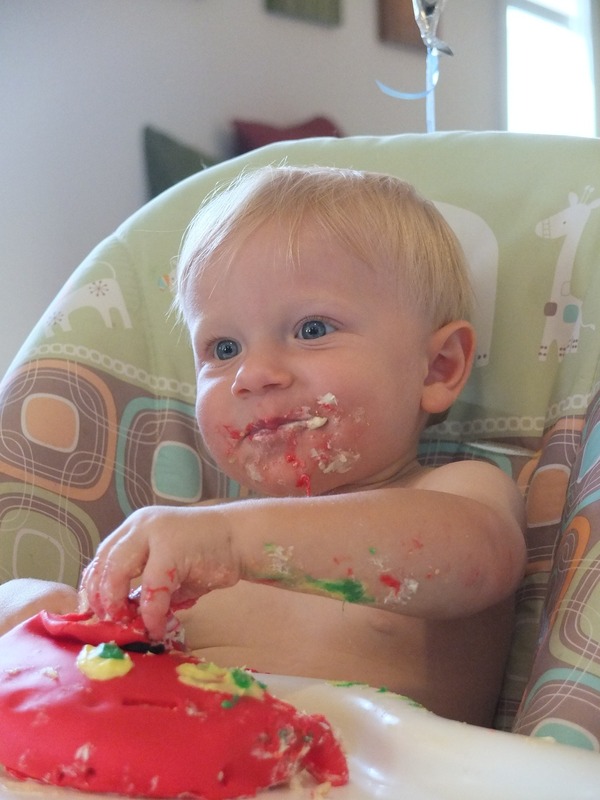 What did you do to celebrate your child’s first birthday? We do very simple, un-themed parties for immediate family only. When our children are old enough to remember parties, we’ll make them slightly more memorable. We’re also planning to do a tour of the state and national parks of their birth state at age 13 or 16. A little reconnection after many journeys and moves. Wow! I am thoroughly impressed. We kept Nolan’s first birthday party pretty low-key, but I went all out for his 2nd birthday. We did a Lorax theme. I think everyone loved it, but it still didn’t look as cute as yours! Ohhhhh a Lorax theme is a great idea! I’m sure it was amazing! Wow, what an incredible first bday! I’ve been a total slacker when it comes to celebrations. My oldest turns 5 this September, so I might have to bring out the big guns. Or, maybe we’ll just rent out an inflatables place, order pizzas & call it a win! Definitely call it a win! What a wonderful family photo too. This party takes the cake…so to speak. Des’ birthday is right before Scarlet’s so while they’re still young, their parties are smushed together and I’m sad to say, Des, that this year you’re having a princess party. Sorry. Boss says. Last year you had an Alice in Wonderland party. It’s ok because we do something special for him on his actual birthday. And we can’t get away with this much longer! I would definitely do the same thing. Princess party it is! Wow I wish I had seen this when my kids turned one! 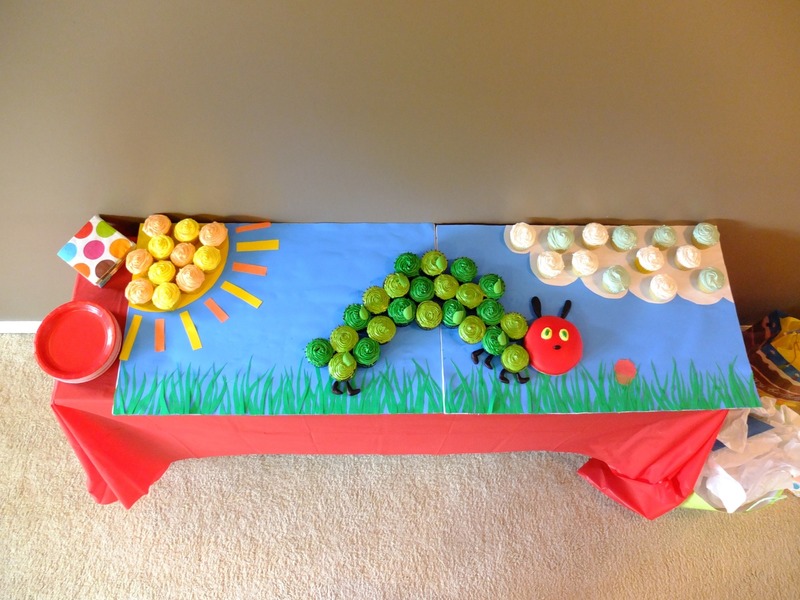 I actually had a board on Pinterest all about the hungry caterpillar because I really wanted to do it as a theme. But unlike you, I didn’t get creative with it (despite my career in graphic design!) and opted for a different theme. You did a really good job Katie. I would’ve pinned each of these images for my imaginary hungry caterpillar party lol. These days I do “themes” but all that means is that I order a cake topper in the theme and order the party supplies in that theme. We have our kids’ parties in a park, so that limits us a bit since we can’t hang things from ceilings or drape them over walls. So we stick to basics like cake, supplies, invites and such. I’m also brewing ideas for what to do for my eldest’s party coming up in several months. It’s fun to think and plan about! That looks like an awesome party, Katie! We definitely had theme parties, especially when the kids were little. Some were: puppies, rainbows, superheroes, pool, dinosaurs, and sports. But I was lucky – there was no Pinterest to keep up with back then! One thing I remember from the dinosaur party – we got a few huge boxes (like the wardrobes you use when you move) to be “caves.” The kids took turns going in the caves and drawing on the walls. This was for a third birthday, though – not sure if that would work for two year olds. Ohhhh I love, love, love that idea! This turned out AMAZING! I am so jealous! I need to borrow your SIL and you next year when I am planning- even just for some creative direction. Can’t wait to see what you do in August! I assure you it won’t be this labor-intensive! Great point about it being gender-neutral! That’s adorable. I like how simple yet fun the theme was. It’s cool to see how many ideas you can find online for birthday parties these days. Invites are for sure fun to design but there’s some good site that have great templates. Personally, I love finding ideas on Pinterest. Thanks for sharing! I agree, there are so many awesome ideas out there these days! Thanks for stopping by! 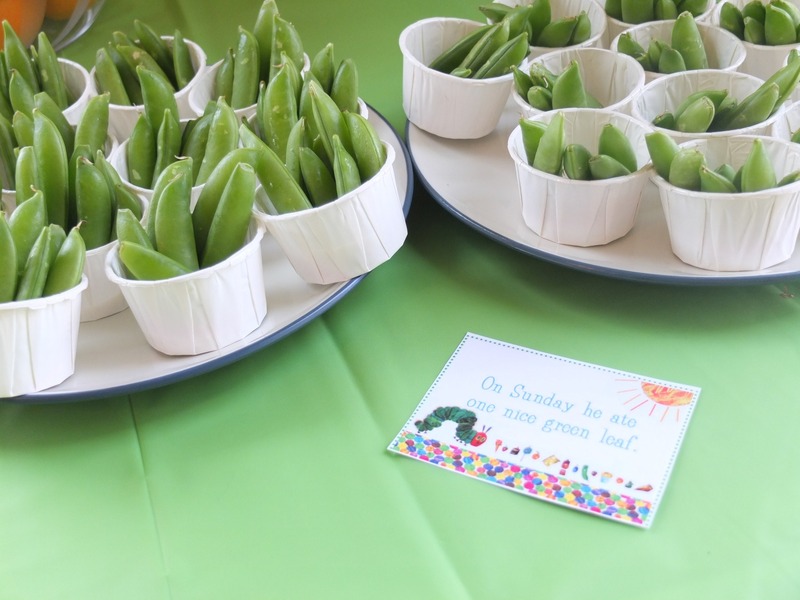 I love The Very Hungry Caterpillar – so this was absolutely delightful! 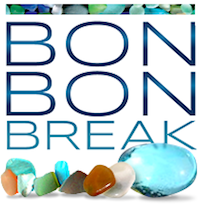 I totally have to get my preschooler hooked on that book so we can do this next year… LOL. I always do a theme…Love themed birthdays! My first son’s 1st birthday I did Dr. Seuss and now for my second son’s 1st we are doing Eric Carle theme! (His name is Luke also!) So happy I came across your post I love the banners and cupcake table!! Sounds like we have a lot in common! Glad you found the post useful, and I bet your party is going to be awesome! Hope your party goes off without a hitch! Love the idea of having everyone sign the book! I did the exact same theme for my daughters first birthday! I love how you put the caterpillar in grass!! Hello Katie. I’m doing the same theme for my sons 1st birthday! Everything you did is adorable! I’m wondering where you got your banner? Great job!! Where did you get the Happy Birthday Luke banner? I love it!! So glad you like it! I just updated the post with the link to the banner/garland on Amazon. I hope that helps! what size boards did she use for the cupcake arrangment? Your party is very cute! Did you make your cupcakes or have them made? What are the legs of your cupcake arrangement made of? Thanks, Allison! My sister-in-law made the legs out of homemade fondant that she turned black with food coloring. Hope that helps!